I have embossed a background of stars on this mostly monochrome card. I have stamped the wording in black lettering and added it on top of the stars. 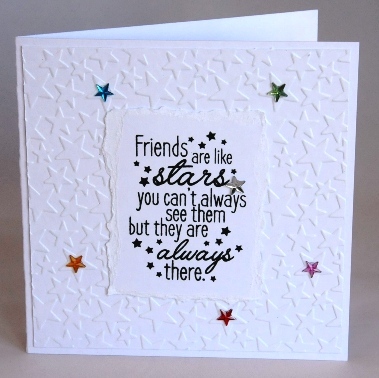 To finish the card I have added a few pops of colour with some tiny acrylic stars. The card is blank inside for you to add you own special greeting. If ordering by phone, please reference card #773.